This one is a high tech machine. 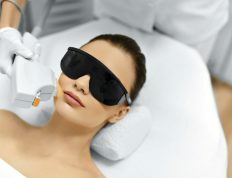 Powerful photons will penetrate skin to reduce pores, scars, brown marks and spider veins. You live only once, but if you are pretty, once is enough! Feel free to get in touch using the button below. We’ll be more than happy to answer any questions. We’ll also help you decide what’s the best treatment for you, pros & cons and when’s the best time to have it. Catwalk uses the latest IPL system for facial rejuvenation. IPL stands for Intense Pulsed Light, also known as photorejuvenation or the photofacial. Treatments are performed at doctor’s offices and beauty clinics, and can be fantastic for erasing pigments, fine lines, mild sun damage, freckles, evening the skin tone and eliminating light brown spots on the face, neck and chest. IPL shoots the skin with quick and powerful flashes of light. The light photons penetrate below the skin’s surface, where the unwanted brown pigment or loose connective tissue is placed. Besides destroying this unwelcome pigment, IPL can also have a subtle effect on fine wrinkles, large pores, rosacea and spider veins. The great news is that there is no downtime! Because IPL uses multiple wavelengths of light, it is not technically a laser, so it works without causing any irritation or deep resurfacing. IPL only causes a mild redness. Some people see sufficient results after the first session, but most clients will need three to five sessions, one month apart, with maintenance visits twice a year. IPL machine is super expensive and learning how to work with it is time consuming and requires experience and patience. Here at Catwalk we charge about $400 and up per treatment.